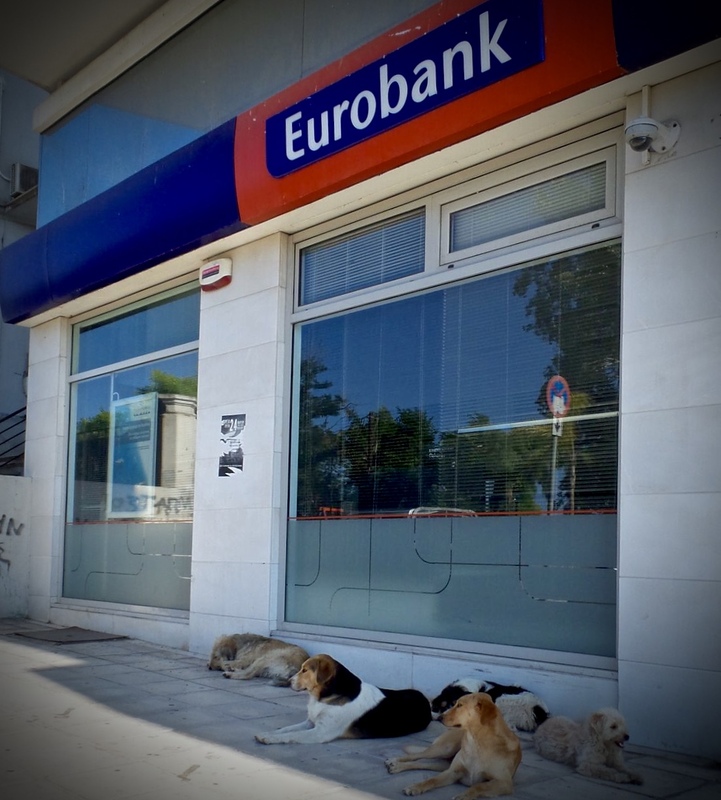 The banks have gone to the dogs. Greece is ruined, and we’re all gonna die! Just kidding. Everyone is fine. Don’t worry, the Greeks won’t be rattled so easily, and they certainly will not be bullied by the EU or the media. It has been very interesting chatting with people here about the crisis happening and watching history in the making. Yes, the issue here is very serious and extremely complicated. 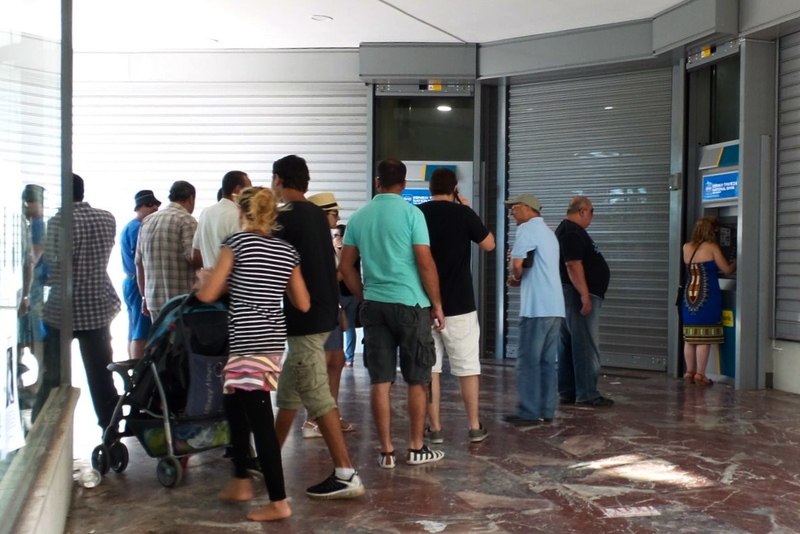 The future of Greece is on the line, but people are still going to work, getting groceries, and meeting with friends and family in the evenings per usual. The streets are busy with traffic as are the many cafes and restaurants that are such a big part of everyday Greek life. The media has done a great job of sensationalizing the situation and scaring off tourists in the week leading up the big vote in Greece. In the news I’ve seen mostly pictures of people hunched over, sitting alone, looking sad, photo on top of photo of unhappy people standing in long lines at ATM’s. I’ve read and listened to the news saying that money and food will run out by the end of the week, that tourists better bring a lot of cash, all their cash if they insist on visiting. I have not stood in line for an ATM for more than 5 minutes and withdraws from foreign accounts are not capped. My expanding waist line from all the delicious greek food might actually be more likely to blame for any food shortages. Furthermore, the Greek government, in attempt to lessen the burden of closed banks has made the road tolls and public transportation free for the week. There seems to be some feeling of caring for the people during this time. The government wants to show the people that they will be supported. 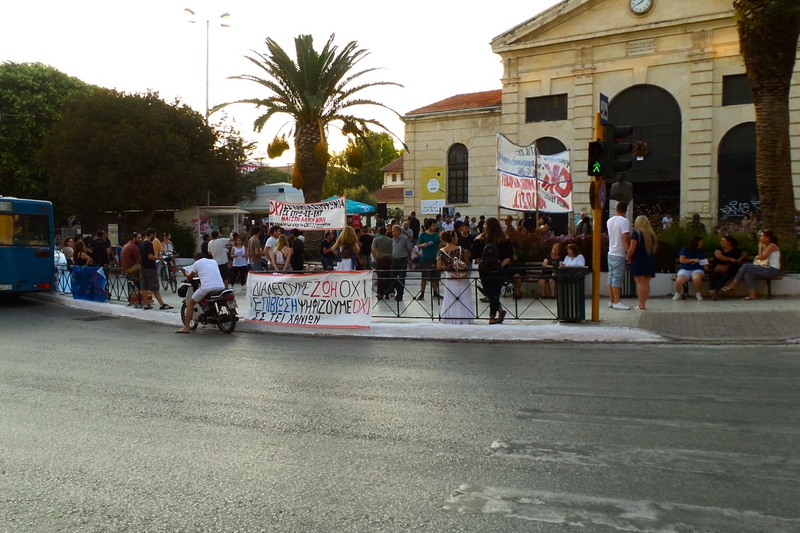 The Greeks want to stay united even if they have opposing opinions. Because regardless of the outcome, they are all in this together. Sunday night after polls closed for voting on the referendum, almost immediately it was clear the “no” vote would win by a landslide. The Greeks “no” vote shows that they are not scared and will not be blackmailed by the EU leaders. Most of the Greek I have spoken with say to me, with the utmost confidence, “forget the EU, we don’t need them if this is how they want to treat us.” The gathering in the streets after the vote were full of cheering, optimism, and unity. Though many feel they have no idea what this may really mean for the future of Greece, they are ready to face whatever may come. Most Greeks I have talked to are not scared, they don’t use the word worried. They continue with life. They are proud to be Greek and hope that there will be a positive solution. Many seem to understand that politicians will play their games and the people will go on doing the best they can with what they’ve got, but they are not pushovers. For many this isn’t the first time they are seeing something like this. Greece is rooted in a deep history of outspoken philosophers, visionary architects, and dramatic theater. They have dealt with the Romans, the Ottoman Empire, they fought for and reclaimed their independence in war, suffered at the hands of the Nazis, and put up with corrupt politics resulting in major, historical demonstrations in the 70’s and more recently just a few years ago. They have not recoiled in the past to the government, it seems they will not start now. Perhaps this experience is why they can’t be so easily shaken. In the meantime, the Greeks I’ve been hanging out with have been BBQing, taking road trips, going out, and otherwise enjoying their summer. It’s a fascinating, unpredictable time and I wish the best for the Greek people.